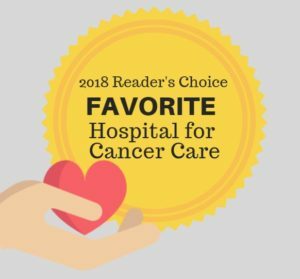 Cancer Center of Kansas has been named the Favorite on the 2018 Wichita Eagle Reader’s Choice Best list under the category of Best Hospital for Cancer Care. Each year, thousands of community members vote on their favorite places to spend time working, eating, drinking, shopping, running, playing and on where to receive their care. Stipulations of the annual contest include: each category must receive a reasonable amount of votes to be considered recognizable and voters are only allowed one vote per category per day for a period of 30 days. CCK appreciates our community for voting and for recognizing CCK as one of the best in quality cancer care! To view the full list of winners and favorites in this year’s list click here.